As spring emerges with longer days and more sunshine, Livigno is still covered in a carpet of snow, from the village to the mountain tops. For those of you who are thinking about enjoying the spring conditions, we have a deal, just for you during the week of 30th March – 6th April. 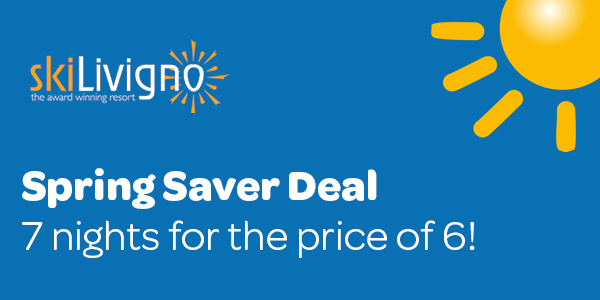 Our ‘Spring Saver’deal means that instead of paying for 7 nights for an apartment, you will pay for only 6 nights, so 1 night is FREE, and it doesn’t end there! If you also buy any of our ‘Ski Extra’ packages, you will receive 6 days but only pay for 5! Here is an example, based on 4 adults. Other ‘Ski Extra’ packages are available, including ski school!